I want you as the reader to think back to 1987. Do you Remember a highly addictive coin-op that etched Irem Corp into our retinas? If you don't (GASP! 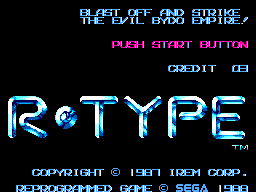 ), said coin-op was a brilliant shoot-em up called R-type. This is the coin-op conversion for the master system that was released for a drooling fan base in 1988. The object of the game is destroy the evil Bydo empire, thus saving earth. 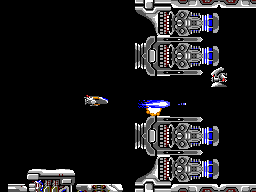 In order to do this the player must complete many side-scrolling levels of chaos, dodging enemy fire, picking up a pod and weapons upgrades and defeating the boss at the end of each level. The pod the player picks up also fires shots when not linked to the players ship and can be used as a shield to absorb enemy fire. The game has been designed to make things difficult for the player, you need to not only be able to blast anything that moves but have some luck and foresight to avoid some problems that are ahead. Sometimes the player is so preoccupied in dodging enemy fire they fail to notice that turret gun affixed to the wall... The addition of "Checkpoints" throughout the levels is a godsend. This means if the player dies, they need not restart from the start of the level, but instead restart from a pre-defined point that the player has past in the course of the level. The graphics are absolutely mind-blowing in terms of detail, nearly the original coin-op quality! Also, unlike many other shooters ups available, R-type has no noticeable slowdown when more than 3 moving sprites are displayed at a time. This is absolutely sensational, and proves a lot of time and effort was spent on this wonderful conversion! A decent conversion of the coin-op's music, but it's held back by a slower tempo than the original. However, it still definitely reminds one of the arcade version. The sound effects are excellent, when you explode a enemy you hear that nice "pting" sound just like you did on the coin-op. Control is via a Control Pad or a Control Stick. 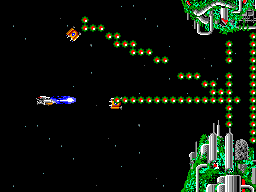 The D-Pad is for moving the players ship while Button 1 is used for shooting and if it is held down it charges the player's weapon into a powerful blast once released. Button 2 is for linking and de-linking the pod that attaches to the players ship. Controls are highly responsive, which is to be expected for a game of this caliber. This conversion is wonderful, it brings a tear of joy to my eye. The only real thing that could have been improved was the tempo of the music and maybe a score counter like in the coin-op. This game is massively addictive, which makes you want to play it until you beat it. It's addictiveness slowly seeps into your brain while at work, school, etc., until you can think of nothing else. However, when you finally beat it, there is no longer anything left to do but bask in a job well done. Until a few months later when you pull it out to have "just one go" on a rainy afternoon and become re-addicted to it.